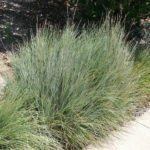 If you are in search of an ornamental grass that has sizable impact, look no further than giant sacaton. What is giant sacaton? It is a southwest native with a full head of unruly leaf blades and a 6 foot (1.8 m.) stature. It is drought tolerant, making it an excellent substitute for other water loving ornamental grasses. Try growing giant sacaton grass en masse for a billowy, action packed display. Giant sacaton (Sporobolus wrightii) isn’t as well known as other big grasses like pampas, but it has both winter and drought tolerance that make it a star in the garden. The perennial, warm season grass is relatively maintenance and disease free. In fact, giant sacaton care is so minimal you can practically forget the plant is there once it establishes. Giant sacaton has several seasons of interest and is deer and salt resistant. It is the largest of our grasses native to North America and grows wild on rocky slopes and moist clay flats. This gives you an idea of the tolerance of the plant to soil and moisture level conditions. United States Department of Agriculture zones 5 to 9 are suitable for growing giant sacaton grass. Giant sacaton info sourced from other gardeners indicates that the plant can stand up to snow, wind and ice, conditions that would flatten many other ornamentals. The leaf blades are slender but apparently quite strong. The feathery inflorescence is blonde to bronze in color, makes an excellent cut flower or dries to make an interesting winter feature. This ornamental plant prefers full sun but can also thrive in partial shade. The warm season grass begins re-growing in spring when temperatures reach at least 55 degrees Fahrenheit (13 C.). Giant sacaton grass tolerates alkaline to acidic soil. It even thrives in rocky, low nutrient situations. The plant is fast growing, even from seed, but it will take 2 to 3 years to produce blooms. A faster way to grow the plant is by division. Divide every 3 years in early spring to keep the centers full of foliage and to encourage denser growth. Plant each section individually as new giant sacaton specimens. This is a plant perfect for lazy gardeners. It has few disease or pest issues. The primary diseases are fungal, such as rust. Avoid overhead watering during warm, humid periods. When installing new plants, keep them moist for the first few months until a root system establishes. 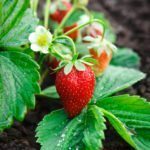 Thereafter, the plant will need supplemental moisture only in the hottest periods. Cut the foliage back to within 6 inches (15 cm.) of the ground in late winter. This will allow the new growth to shine and keep the plant looking its tidy best. 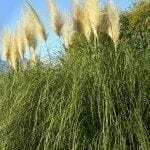 Read more articles about Sacaton Grass.